Cathedral Catholic quarterback DJ Ralph drops back in the pocket against Narbonne in the fourth quarter. San Diego High is clearing space in its front office to display the Cavers’ state championship football trophy. Images of Cathedral’s Shawn Poma giving DBs a view of his back on the way to touchdown dashes are fresh in the memory bank. 1. 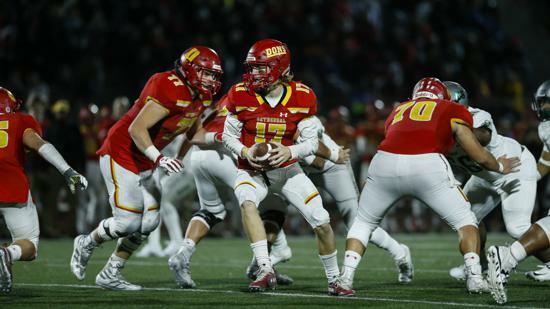 Cathedral Catholic: Fret not for the Dons losing Poma, the San Diego Section Offensive Player of the Year. Four starting offensive linemen return. So does quarterback DJ Ralph. Outside linebacker Jordan Allen gets after it. Dons earn sartorial bonus points for wearing their red helmets with Uni written on the side late in the season, an ode to the past. 2. St. Augustine: Joe Kremer directed the Saints to the section Division I title in his first season as head coach. He runs out of fingers and toes counting all the returning talent, led by linebacker/tight end Michael Ambagtsheer and running back Byron Cardwell. Fans are probably already ordering tickets for Holy Bowl 57. 3. Mission Hills: The Grizzlies have advanced to 13 straight Open or Division I semifinals. With Pac-12 recruit Quinton Hadnot at corner and wide receiver, talented linebacker McKyle So’oto and QB Jackson Oksnee earning experience as a sophomore, Chris Hauser’s bunch will stretch that streak to 14. 4. Helix: It helps when you start with running back Elelyon Noa, who has rushed for 4,745 yards and could threaten Royce Freeman’s section career record of 7,601 yards. Add all-section DBs Xavier Hamlett and Delshawn Traylor and the bagpipes will continue blowing in La Mesa. 5. Carlsbad: Head coach Thadd MacNeal busted the U-T’s chops for not being selected in this space’s Top 10 a year ago. The man was right, as the Lancers advanced to the Open Division. With eight defensive starters back, we’re not making the same mistake again. 6. Eastlake: John McFadden has been running the double wing since 2006 but after quarterback Richard Colmenero III passed for 2,111 yards and 24 TDs, the Titans will shift to the spread. Figure Darius De Los Reyes (39 catches, 791 yards) will pad those numbers. 7. San Marcos: Quarterback Miles Hastings is off to UC Davis, but offensive wizard head coach Jason Texler will find ways to put points on the scoreboard. It helps that the Knights are loaded at wide receiver with Jalen Bainer, Zavion Reese and Gavin Cherveny, who combined for 16 touchdown catches. 8. Steele Canyon: The 2017 state champion Cougars knocked off Helix this season, gave Saints a battle in the Division I semis and figure to be very good again. Safety Chance Johnson is being recruited by Pac-12 schools. Watch out for running back Wes Neely, who averaged 12.7 yards per carry as a sophomore. Elelyon Noa (Helix, RB, Sr.): Brother Ezekiel, now a starting linebacker at Boise State, was the section Defensive Player of the Year in 2016. Elelyon is the favorite for 2019 Offensive Player of the Year. Ross Maseuli (Cathedral Catholic, OL, Jr.): There are Carmel Valley condos smaller than the 6-4, 315-pound Maseuli, who is simply dominant. Quinton Hadnot (Mission Hills, DB/WR, Sr.): A cover corner and fleet pass catcher. Doesn’t shy away from the big stage. Michael Ambagtsheer (St. Augustine, LB/TE, Sr.): At 6-4, 240, the kind of physical player that makes coaches smile when rewinding tape. Cole Wright (Carlsbad, WR/DB, Sr.): Tremendous ball skills. College assistants debating whether he’s best at corner or wide receiver. Mo Jackson (San Diego, RB, Jr.): Dangerous on the ground. Dangerous through the air. Fitting that he wears No. 7 because he scores lots of touchdowns. Ke’ontae Springs (Madison, RB/DB, Sr.): With Kenan Christon gone, the elusive Springs will get the bulk of the touches for Warhawks. Jordan Allen (Cathedral Catholic, LB, Sr.): Can drop into coverage, put the heat on QBs and run down plays from the backside. Marco Notarainni (Torrey Pines, LB, Jr.): At 6-3, 195, he’s strong enough to play inside with leverage, fleet enough to cover outside. Others: Steve Wynn (DE) Carlsbad; Josh Butler (RB) Poway; Patrick White (DB) Lincoln; Sam Scaife (WR) St. Augustine; Dee’Shon Swafford (DB) Cathedral Catholic; Logan Berzins (OL) Cathedral Catholic; Nick Sylvester (OL) St. Augustine; Conner Heffler (LB) St. Augustine; Delshawn Traylor (DB) Helix; Kavika Tua (RB) Oceanside; McKyle So’oto (LB) Mission Hills; Angelo Peraza (QB) St. Augustine; Ulolo Samoata (DT) Steele Canyon; Desmond Taua (athlete) Vista; Christopher Laie (DE) Oceanside; Deniro Osuna (QB) Central; Shiloh Seau (DL) Mission Hills; Gunnar Gray (QB) University City; Jaime Odom (QB) Grossmont; Tyler Buchner (QB) Bishop’s. The longtime South Bay football coach is calling it a career after 28 seasons.